Buyer personas sum up core segments of your target audience, helping your team to quickly grasp what makes your customers tick. While defining your target personas can feel like you are excluding other potential buyers, it actually brings clarity and focuses you on your “market center” customer—the 80% who have the most to gain from your offerings and are most likely to respond to your marketing. Target personas help teams create winning products, effective messages, and compelling customer journeys. First conceptualized in the 1980s by renowned software designer Alan Cooper, target personas are data-driven profiles that represent core segments of your ideal customer base. They’re fictional in the sense that they don’t actually represent living and breathing human beings. Instead, they summarize the quantitative and qualitative data collected while researching a specific group of ideal customers. Because each segment of prospective customers shares demographic, psychographic, and behavioral traits, these data points can be lumped together to create synthesized portraits of your ideal customers. Conversion Copywriter Jan Havice perhaps said it best when she wrote "Personas are fictional representations of segments of buyers based on real data reflecting their behaviors." 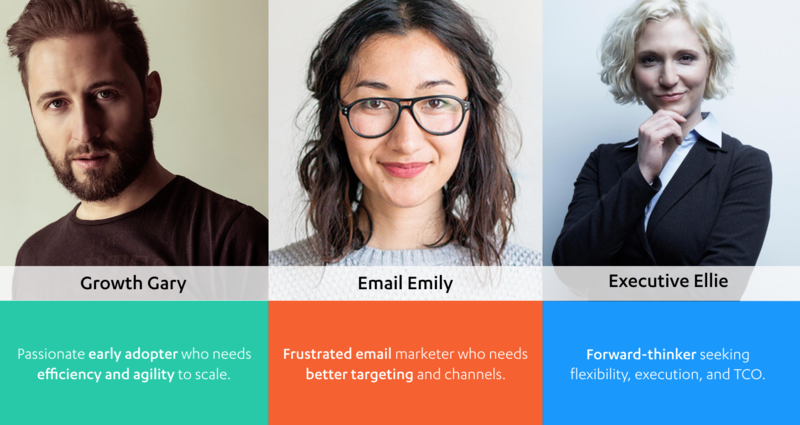 Keep in mind: Target personas aren’t a document, even if they’re presented that way. Your goal should be for you and your team to know your ideal customers inside and out. According to a 2015 study by Econsultancy’s Stefan Tomquist, 4 out of 5 brands claim to have a holistic understanding of their key customer segments. Despite this, just 22% of customers feel understood by brands. That means that either brands are failing to tailor the customer experience based on what they know about each customer segment, or there’s a gap between how well brands think they know their customers and how well they actually do. Without this understanding, you can’t define a resonant brand voice, craft relevant content or choose appropriate outlets for promotion. Target personas are thus valuable because they concisely summarize key points about your audience. Once you’ve completed the following exercise, you should be able to sum up each of your target personas in one descriptive sentence. For Growth Gary in the example above, it could be something like "Growth Gary is a passionate early adopter who needs efficiency and agility to scale." This sentence tells us who Gary is, what he needs, and what he wants to achieve. You’ll notice that we’ve named our target personas. Not all marketers believe in this practice, but we’ve found it super helpful. Giving your personas descriptive names (like “Growth Gary” or “Executive Ellie”) helps distil essential attributes about your ideal customers. It also helps increase adoption of your personas since these names are easy for team members to remember. Use a template like this when creating your own target persona. This one is tailored for B2B. Most marketers include demographic and/or firmographic data in their target persona deep dives. These details help transform a profile into a person. At minimum, B2C marketers should include core characteristics, such as age, gender, and location. However, they may also want to include total household income, education, and family composition. At minimum, B2B marketers should include the persona’s company type, size, and industry. It may also be helpful to include their location, annual revenue, and number of employees. For example, our software is used by both B2B and B2C marketers. Because these customers face significantly different challenges on a daily basis, it’s important for us to understand whether the majority of buyers under one persona work for B2B or B2C companies. That way, we can craft relevant content that speaks to their needs. How do we know Growth Gary when we see him? We look at his title. While this isn’t an exact science, it allows us to make an educated guess about who we’re talking to early on. You can easily pull titles from your contact database, but it’s only after speaking with buyers that you’ll come to understand which titles fit within each persona and what their role in the buying process is. Each individual plays a specific role within the buying process, separate from their role within the organization. Regardless of title, what are they responsible for achieving? During the buying process, are they an evaluator, influencer, or decision maker? What level of authority do they have? Can they sign checks and/or approve expenses? Some marketers stop short of providing strategic direction in their target personas. But it’s a fantastic way to get everyone on the same page while making your colleagues’ lives easier. The first step is to identify your customer’s pain points. These are challenges or underlying frustrations that block your buyer from achieving their desired outcome. If your company can help the buyer overcome these issues, they’ll have no problem paying to make it happen. Needs are urgent problems that must be solved, which is why they take priority over mere pain points. While customers are interested in relieving their pain points, they’re much more motivated to get their needs met. What challenges require a budgeted organizational initiative to resolve within the next 6 months? What would happen by the end of the year if this need was not resolved? What would be the benefit to your organization if this were resolved within the year? Pro tip from Autopilot CMO Guy Marion: Aim to deliver morphine, not vitamins. While vitamins help reduce painful symptoms, qualified buyers can’t live without morphine. Pro tip: Aim to deliver morphine, not vitamins. While vitamins help reduce painful symptoms, qualified buyers can’t live without morphine. Next, identify the top 2-3 reasons these customers buy your product or service over a competitive solution, based on the pain points you’re uniquely positioned to solve. Alignment with your vision or brand. Your company clearly stands for something that is attractive and compelling. Time to value. This refers to how quickly a buyer can get the full benefit of the product or service and, in doing so, solve their core problem. Unique features or user experience. Do you offer functionality or an in-product user experience that’s unique to your solution? Does it solve one of their top needs or challenges? Price. Pricing is the exchange rate between the value of the product and spending power of the target buyer. Price too low and risk being unprofitable (which is unsustainable for business) and/or undervalued. Price too high and risk shrinking the size of your market or introducing complexity into the sales process. The sweet spot is to charge the maximum amount that your ideal customer is ready to pay with minimum push-back, while still attaining attractive financial terms for your company. Total cost of ownership (TCO). This refers to the total cost of using a given solution, on an annual basis and over it’s lifetime, when factoring in every relevant cost. This might include license fees, third party add-ons, consulting and implementation services, support costs, staffing and recruiting costs, and even development time. Customer experience. Companies like Zappos and Amazon rewrote the rules of customer service by going to extreme lengths to deliver a wow experience. For many, this is enough to overcome technical, budget, or even alignment concerns. Ease of setup and implementation. When the risk of failed implementation is low because your service is easy to use or has a bulletproof onboarding process, customers are far more willing to try your solution. Integration and connectedness. The rise in popularity of API-based app ecosystems means that connected and open technology platforms win clients seeking highly customizable configurations. Referred by a trusted peer. A startling 71% of consumers who receive a referral on social media are likely to make a purchase, while 90% of people are influenced by their friends’ brands recommendations. Tomasz Tunguz wrote an article called Startup Judo. In it, he wrote "there are two basic tenets of judo: First: never to oppose strength with strength. Second: maximize leverage." Keep these tips in mind as you work through why you win. "Growth Gary is frustrated with inflexibility of systems and scattered customer lifecycle. We win because Autopilot gives him the controls to manage the complete customer lifecycle in one system." [Persona name] is [key pain point] and [key pain point]. We win because [key reason] and [key reason].